In the midst of an impending global release of its 4 phones unveiled at MWC 2017, more rumors and leaks are surfacing regarding a flagship Nokia device, the Nokia 9, which is widely anticipated to release this year. We have already seen images of the prototype Nokia 9 leak encased in a beefy cover. Now we may have a chance to look at its innards. More particularly, it’s processor. 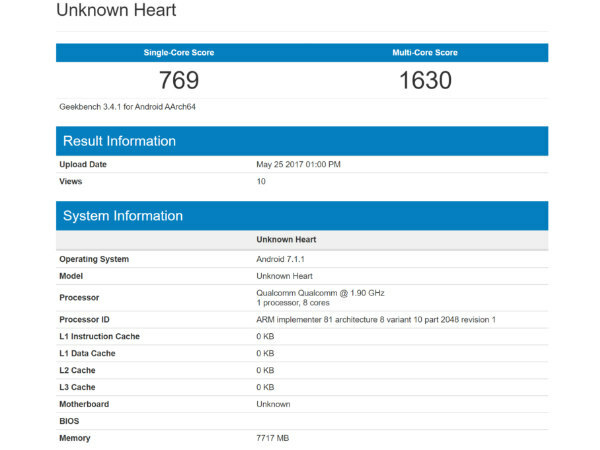 This time, a new Geekbench result has been leaked showing an alleged unknown heart Nokia model with a Snapdragon 835 processor. Since the Nokia 9 is expected to rock the Snapdragon 835, the Benchmark showing “ARM implementer 81 architecture 8 variant 10 part 2048 revision 1” confirms this to be the Nokia 9. But the more intriguing part is the RAM which stands at 8GB. What arouses suspicion is the fact that the Nokia 9 has already appeared in an early Geekbench leak sporting 4GB of RAM. Moreover, the single and multi-core scores of that device are even higher than this particular device. One explanation might be that we are looking at a new variant of the Nokia 9. Whatever the case might be, we still have quite a lot of time to go before the Nokia 9 breaks cover, and new details might clear the matter. Among other specs of the Nokia 9, it is expected to sport a 5.3-inch QHD display, 64GB of storage, and a 13MP dual camera setup at the back. It will be quite pricey as well with reports stating as much as €750.